Some of the best science fiction of the past 60 years or so has revolved around the concept of artificial intelligence, and the potential for robotics to mimic humanity. As we get closer to the reality of such things, we begin to examine the powers, limitations, and emotional effects a human-looking electronic being could have on the human race. 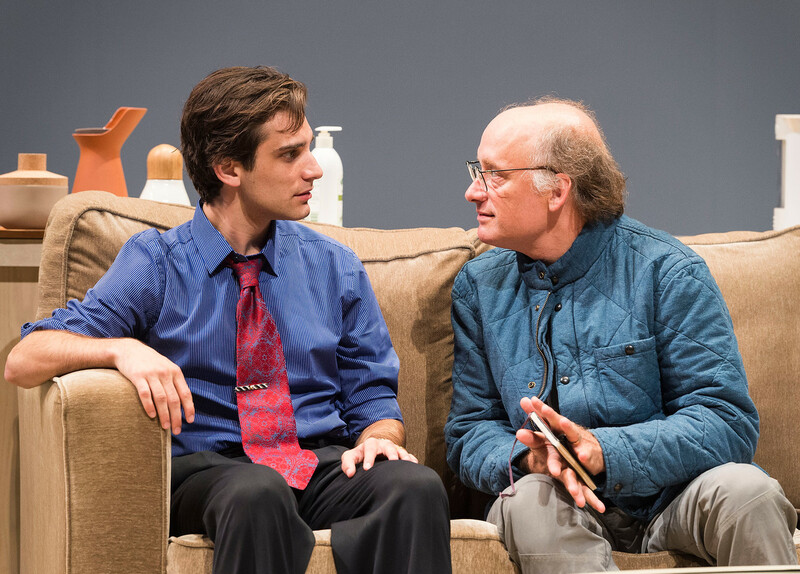 Which brings me to “Marjorie Prime,” a play by Jordan Harrison receiving its world premiere at the Mark Taper Forum. In some ways it says things echoed in other quarters about the limitations of programming, in other ways it offers a new examination of the plusses and pitfalls of emotional interaction with humanoid machinery. The given in the world of “Marjorie Prime” is that one can create a robotic version, physically anyway, of someone who has passed away. That “prime” version of the person must then be programmed through the process of human reminiscence to talk and behave in a way that will mimic the original person. According to Harrison, the effects of such a thing will vary, depending on the person and the circumstance, from therapeutic to destructive. Lois Smith is Marjorie, a woman with advancing dementia. We first meet a “prime” in the form of Walter Prime (Jeff Ward), a youthful-looking replacement for the husband she lost long before, whose programming by several people allows him to remind her of her own past, and – as in “The Notebook” – keep Marjorie more connected to her own history than would otherwise be possible. Marjorie’s world is also populated by those who love her: her frustrated, sometimes bitter daughter Tess (Lisa Emery) and her gentle, empathetic son-in-law Jon (Frank Wood). As time goes on, Marjorie and later Tess become “prime” versions. What was therapy for someone without a memory becomes hauntingly incomplete and increasingly painful for those whose memories are intact but limited to their own perspectives, making it difficult to program the replacements themselves. Will programming a prime stave off loss? Did the programmer “get” the interior monologue of the lost person well enough to create an imitation with any kind of veracity? Smith makes the distinction between Marjorie and her “prime” version a symphony of subtleties. 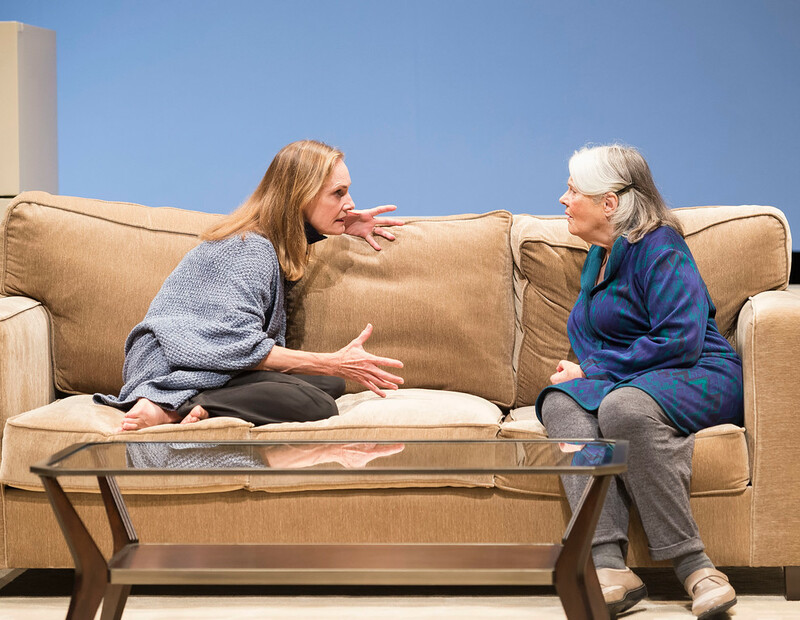 Her spot-on dementia persona drifts into a static, formula personality in ways which underscore the point of the play. Emery’s Tess moves from frustration with impending loss to frustration with the limits of imitation, to the blandness of imitation itself. Wood’s Jon, played as a man whose heart is big and often worn on his sleeve, curdles as his world is increasingly artificial. And – in one stark statement of a scene – the three primes try conversing with each other as if they were real. The conclusions are all in there. Director Les Waters moves the setting and tone of the piece into increasing isolation, just as the play does. Sometimes this makes the staging rather static – unfortunate in a work which is all underplayed to some extent, to maximize the few moments of great emotion. Mimi Lien’s minimal set, which moves at one point to make its own interesting statement, keeps the focus on the personalities (or, in some cases, the lack of personality) which make this play interesting to watch, but emphasizes their bleakness and increasingly spare environment. 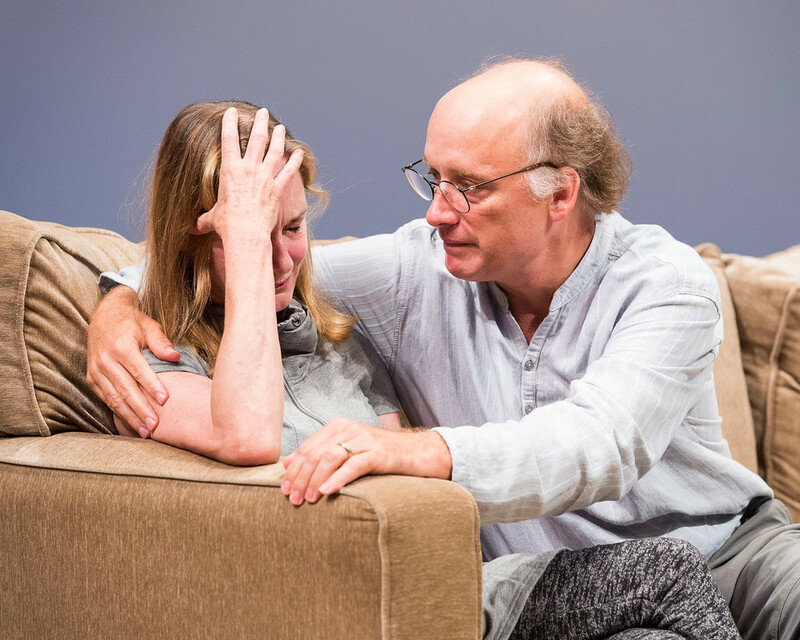 “Marjorie Prime” moves slowly, and is performed without intermission. As a play it is a “ponderable,” and that balance between what has been said before and what is new may inspire many to dismiss it as almost cliché in its view of the potential advances of AI. To avoid that, one must focus on the human characters. One wishes there was a bit more chance to do so.